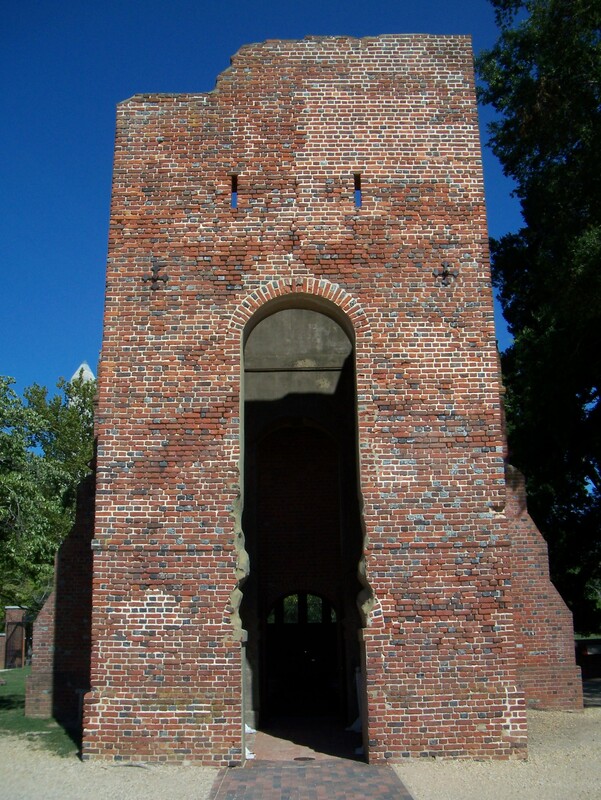 A church tower built in the 17th century in the Jamestown colony of Virginia is getting 5,000 new bricks to shore up its structure damaged by hundreds of years of neglect and exposure to the elements. The bricks are newly made, but they didn’t come off an assembly line. They were handcrafted by historic brickmakers from the Colonial Williamsburg Foundation using period-accurate materials and methods. They made wooden molds from some of the original bricks so the dimensions would be right. The molds were filled with locally dug clay mixed together with water by that most classic of mechanisms: stomping all over it with bare feet. The bricks were sun dried, cured in a covered space for weeks, and then piled up into a pyramid shape to form a clamp, a sort of kiln where the bricks themselves are the walls. Slow-burning fires were built in tunnels underneath a 10-foot stack of new bricks. The stack was then encased by previously fired bricks and coated in a layer of mud or clay. This coating ensures the heat and smoke winds its way through the stack to escape out of the top instead of dispersing in the environment. You can see the brickmakers’ process (and their costumes) in the following video. The professionals at Colonial Williamsburg aren’t kidding around when it comes to historical recreation. The mortar is just as punctiliously produced. The original lime mortar was chemically analyzed so it could be made with the proper proportion of materials. Burned oyster shells are the primary ingredient, which make sense given the coastal location. The reconstruction will require 110 gallons of mortar for each of the four sides of the square tower. And this is just to repair the tower so that it looks pretty much like it looks now. Historic Jamestowne isn’t aiming to return the structure to its original 17th century appearance for the simple reason that we have no idea what it looked like then. The first church on site was made out of timber in 1617, but at some time later in the century it was replaced with a brick church and tower. The earliest documentation of the tower was a note written by a visitor in 1702 describing the church as having a “tower and bell.” In 1750 a new church was built three miles away and this one was left to decay into ruin. The church standing behind the tower now was built on the site of the original church in 1907, but the tower was left standing. In a manner of speaking, that is. What the builders found when they looked at the bricks was a collapse waiting to happen. Matthew Webster, director of the Grainger Department of Historic Architectural Resources for Colonial Williamsburg, said brick construction in the 17th century would typically put the strongest brick on the outer surface and poorer brick on the inside. There has been no roof on the tower for centuries, so rain has entered the walls and done extensive damage to the softer brick. The cement cap and water damaged the top three courses of brickwork to the point where they were no longer attached. Large numbers of the bricks could not be reused because of damage, Webster said. The tower walls are about 34 inches thick at the bottom and about 17 inches thick at the top. A thumbnail formula says it takes a month to completely dry out one inch of a brick wall. When the masons began pulling the tower’s bricks apart, the interior bricks were saturated with water. Then there’s the thicket of plant matter growing inside and atop the brick walls, and all of this is after a major repair project shored up the tower 49 years ago. Some of the original construction materials will be kept as part of the Jamestown Rediscovery Project collection. 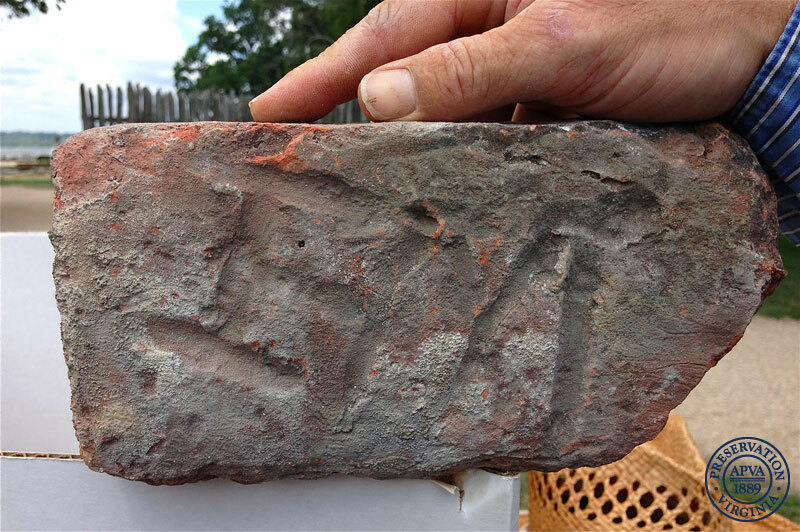 Anything with potential historical interest — a brick with initials drawn into it when it was still wet, another brick sporting an animal’s hoofprint, a chunk of mortar with a glass fragment from a tool used to iron linen — will be preserved. Once the damaged tower bricks have been replaced and the structure is stabilized, the interior walls will be restored. The last step will be to add a custom roof system which will keep the bricks from being constantly drenched but can’t be seen from the outside so it won’t stick out like a modern sore thumb among the historical buildings of Jamestown.